Boxfit is a fat burning, cardiovascular, strength and toning workout. You'll learn traditional boxing skills and techniques in a gym equipped with a full-size boxing ring. Boxfit classes are split into three levels by participants experience! suitable for all fitness levels from beginner's to advanced. more experienced participants get back to basics. this is the ultimate class to combine all that has been taught in a safe, controlled environment. 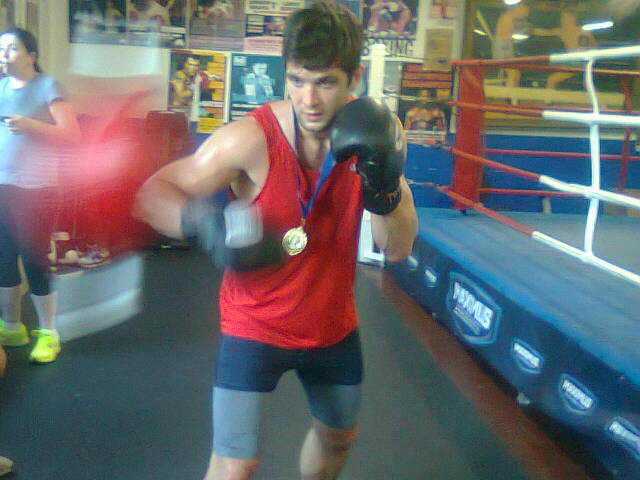 Training with Boxfit has been invaluable. As former Australian Champion, Michael has been a great mentor and the driving force behind my great conditioning and progression and development. These 16oz leather gloves have been specifically designed for sparring and general pad work. The gloves feature extra padding, 100% leather and are manufactured for Boxfit by the same company that produces the world famous Grant gloves. Available in red/gold/silver or blue/red/silver. ​Includes Free Shipping anywhere in Australia. BOXFIT is suitable for males and females of all fitness levels from beginners to advanced from 14 years up.​ BOXFIT is boxing's ultimate fat burning, cardiovascular, strength and toning workout conducted in a traditional boxing gym with boxing ring instructed by former state/national champion.